An ideal casting media has certain properties which makes it easy to inject into the blood vessels or ductal system of an organ. The media/resin should be of a low viscosity nontoxic liquid, polymerize within a short period following injection with minimal shrinking and should be resistant to corrosion, cleaning, and dissection. PVC is available as thick colorless viscous liquid which is stored in airtight containers. Colored resins available commercially in the plastic industries are used to make different colored PVC solutions. One can select the colors according to the vessel, duct or cavity to be studied using the routine anatomical color codes; E.g., red-artery, blue-vein, green-ducts, yellow, white or orange for cavities. To prepare an ideal colored casting medium, the thick viscous fluid is diluted with acetone in a proportion of 1:1 and then a few drops of the colored resin is added. Procurement of a fresh specimen is a prerequisite to prepare an ideal cast. Formalin-fixed specimens cannot be used. To remove blood and debris, the specimen is washed under running water. 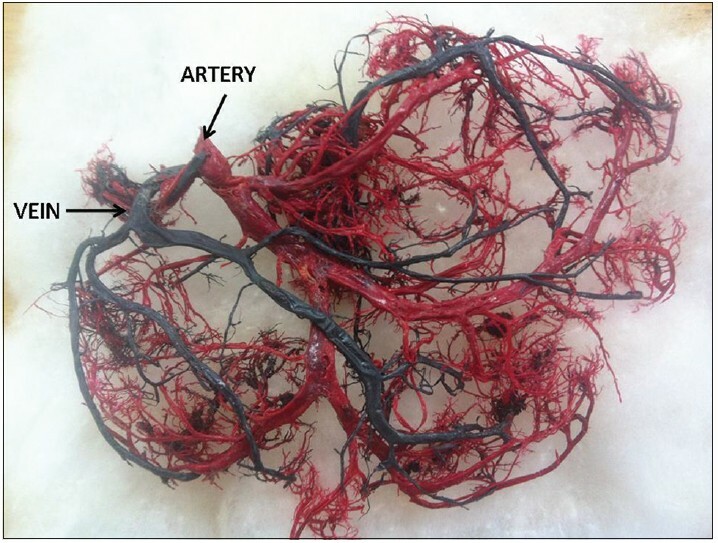 The vessels (artery/vein) and ducts of specimen into which media is to be injected are exposed by careful dissection. Vessels/ducts are flushed with water/normal saline to clear the lumen. However, it causes water absorption and can make the specimen edematous, which can be resolved by immersion in any dehydrating agent. With the help of disposable syringes attached to plastic cannulas, the casting material is injected into the vessels according to the color code [Figure 1]. The injection is continued until a resistance is felt, avoiding leakage from the injection site as it would polymerize and give a false picture. The procedure should take place within an hour, to avoid early polymerization of the casting media. 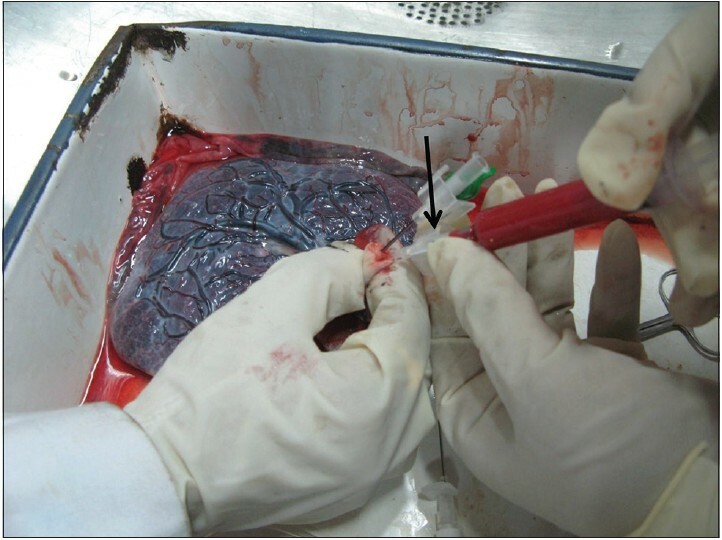 The vessels are clamped and ligated following the injection [Figure 2]. The specimens are kept at 80°C overnight in an incubator for the solution to polymerize in each vessel uniformly. Next day, the specimens are brought to room temperature and washed with tap water. The specimens are then immersed in a large glass container containing 50% hydrochloric acid. The acid gradually corrodes the surrounding tissue. Time taken for corrosion depends on the size of the specimen. Once the corrosion process is completed, the corroded cast is washed gently and with a fi ne forceps all debris is removed to finally get an intact well-formed cast [Figure 3]. 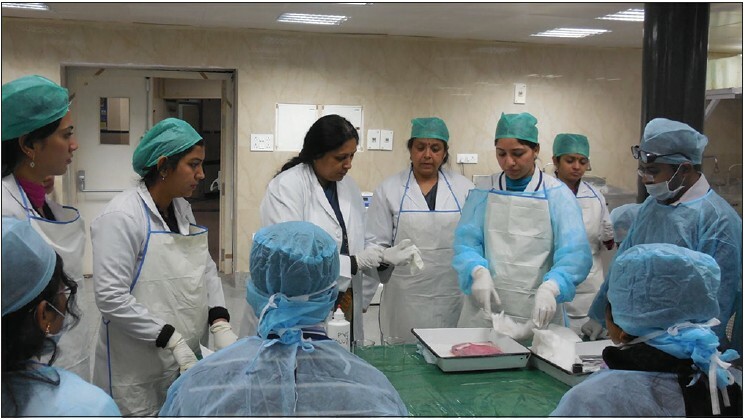 The Department of Anatomy, Maulana Azad Medical College, New Delhi standardized this technique to prepare corrosion casts using PVC solution and is regularly training participants in the annual workshop on "body preservation techniques on embalming plastination and musemology" conducted by the department [Figure 4]. This technique using commercially available PVC solution is cost-effective, easily reproducible, and consumes less time. Casts formed by this method are relatively firm and give an ideal three-dimensional picture of the vascular pattern of the specimen. The standard casts have to be handled meticulously and stored in containers as they become dry and brittle while the PVC casts are firm. Thus, they can be displayed in the museum and used effectively for teaching. Mishra S, Kheya R, Ajmani ML, Murty OP. 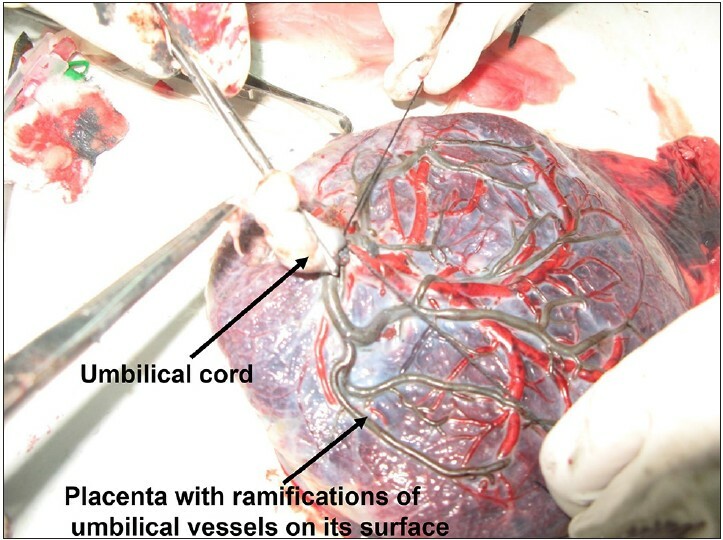 The segmental anatomy of human liver by special technique of vascular injection. J Med Toxicol 1998;XIV: 6-9. Giuvarasteanu I. Scanning electron microscopy of vascular corrosion casts - Standard method for studying microvessels. Rom J Morphol Embryol 2007;48:257-61. Motta PM, Murakami T, Fujita H. Scanning Electron Microscopy of Vascular Casts: Methods and Application. Electron Microscopy in Biology and Medicine. New York: Kluwer Academic Publishers; 1992. p. 416. Hossler FE, Quillen JH. Vascular corrosion casting can provide quantitative as well as morphological information on the microvasculature of organs and tissues. Micros Today Sept 1998;6: 14-5. KinPatrick S. Practical Guide to Polyviny Chloride. 1 st ed., Ch. 1, 4. Shrposhire, UK: Smithers Rapra Publishing; 2005.